1.1 Why Not Use Only Wind Power? “Wind Power” is the extraction of energy from the wind. Common techniques use a tower with a set of propeller blades that will spin when wind blows against them. Wind power is a renewable form of energy because wind is caused by the uneven heating of the earth by the sun. The earth’s wind has an enormous amount of energy in it1 . If even a fifth of it were harnessed, it could provide for the entire world’s current total energy requirements. This would include the energy we currently get from oil for our transportation industry as well as electricity for buildings and industry. There are practical issues that make this infeasible however. Why Not Use Only Wind Power? It is expensive and difficult to build the transmission infrastructure required to transport large amounts of electricity long distances. Without this ubiquitous long distance transmission, electricity sources that are relatively local are usually needed. Countries, and even states and provinces, must generally meet their own power requirements using whatever resources they have locally. In Vision of Earth’s home province of Saskatchewan, this means burning coal and natural gas in addition to using hydroelectric energy and the wind. Many places do not have a high quality wind resource. In an all-wind scenario these places would either have to build wind power in a place with relatively slow winds or import the power from elsewhere. Either of these choices could be prohibitively expensive depending on the conditions. Wind is not a silver bullet for solving our electricity needs. We can use it as an energy resource when it is combined with other types of generating capacity. Until relatively recently there have been cheaper alternatives than wind. Only recently has wind generation begun to seriously compete with the cheapest energy sources available such as coal. Except in a few circumstances, no renewable form of energy other than hydroelectric has been able to compete evenly with fossil fuels in terms of cost-per-watt until relatively recently. With the world’s changing energy market as of 2010, wind has become closely competitive with fossil fuels in many areas. With government incentives in place, wind power has become the best choice for new development in several major nations including Spain, France and Germany. Cost-per-watt analysis now tends to favor wind power in many areas because of the rising price of fossil fuels due to increased consumption and extraction difficulty as well as expected carbon taxes. We are seeing an explosion in the growth of the wind power industry. The amount of energy produced by installed wind power stations around the world is increasing at a tremendous rate2 . This incredible demand for wind power has caused the price of wind turbines to increase a bit recently, but has also been a huge incentive for the construction of new and better turbines. Wind turbines have a lifetime that is usually estimated at twenty years or more. It is likely that with maintenance many will last much longer than that. Compared to other forms of energy, wind turbines typically have a relatively low cost per kilowatt-hour. The disadvantage of wind turbines is that the majority of the cost is incurred before and during construction, so a large investment has to be secured long before any power is generated. This can be contrasted with a coal or natural gas plant, where much of the cost of coal power is the operation of the plant and the acquisition of fuel. On the scale of large nations, wind power tends to average out to approximately the same output as long as the turbines are spread out geographically. Thus if the wind slows in one area, it should not cause the whole nation’s power production to decrease too much in this situation. On a global scale, it might be possible to one day to provide many places with a lot of relatively reliable wind power. The costs of maintaining a power grid capable of handling the intermittent nature of wind on that scale would be very high. In general this is regarded as infeasible, and other energy sources are generally used in conjunction with wind power to create a power grid. For instance, hydroelectric power can be ramped up to meet demand in the case where the wind dies down. An advantage of wind power is that home-made turbines are possible, and investors often see good return on their investment. A homemade project (not connected to the grid) does not require as stringent control of power quality as required by a utility, so some cost is removed. Keeping in mind the intermittent nature of wind, the setup cost of a wind generator is very reasonable. Some applications such as livestock pumps are well served by wind or solar power because they are often far from the grid physically. Building wind or solar installations is quite often a practical choice when such renewable power sources will cost less than a grid connection to where the power is needed. If you wish to have a reserve of power for use during calm times a battery system is required. An array of batteries, whose size depends on how much reserve you feel is necessary, will need to be purchased. Simple electronics exist to make building and managing a battery storage system easy; but no matter how you cut it, a power reserve is expensive. In very remote places this might be your only choice, as grid connection is not available or prohibitively expensive. Renewable power generation such as wind would likely have a lifetime cost below that of a fossil-fuel generator. A grid connected system requires that you meet the standards of your utility’s power quality. Some utilities require that you rent or buy power transforming equipment from them at whatever cost they choose. Some utilities will write you a cheque when you generate more power for the grid than you use, some others will reduce your power bill by the amount you produce, but will not pay you for power you generate beyond that which you use. The choices your utility makes is highly dependent on government pressure to support small scale power initiatives. The advantage of being grid connected is that your power availability is more reliable. You still have grid power when the wind is low and can produce power when the wind is blowing. This is the optimal choice if your government is supportive of small scale power generation and you live near enough civilization to be cheaply grid connected. In general, the wind speed increases the further from the ground it is measured. It is thus advantageous to build on top of hills, and with tall towers to reach faster wind speeds. This is because a wind turbine’s power output potential is based on how fast the wind is blowing through its blades. Coastlines and ocean surfaces are also generally relatively windy, so development in these places is also being pursued avidly. There has been some problems with regards to people resisting developments that impinge on fishing areas, yachting areas, or their view of the horizon. For an example of this sort of controversy, see Wikipedia’s article on the Cape Wind controversy. Wind turbine locations are chosen based on how windy the area tends to be as well as how close they are to where power is required. The tops of mountains may be very windy in general, but they are generally very far from places that require electricity. Additionally, it would be extremely expensive to transport wind turbine parts to the tops of mountains. New large turbines have blades that are over 100m in length. Transporting these blades even on established rails and roads can be very difficult in some places. One possible problem is that each turbine design has a maximum wind speed associated with it. Areas that get extremely high speed winds on occasion may be problematic since they are likely to occasionally force a shutdown of the turbines. What works best for wind power production is relatively steady and fast wind. In cold climates, a warming system is required to keep certain parts from freezing when their own heat of operation is not enough to do so. Periodic inspections of the equipment has to be made to ensure the integrity, similar to the maintenance of a hydroelectric plant. Upon inspection parts may need to be replaced and lubricants may need periodic attention, depending on the turbine design. Wind turbine parts are made of modern materials which are difficult and expensive to make. A wind turbine factory can not be built overnight because of the high grade and complexity of the parts. Because of this, industry has a hard time keeping up with the explosive demand for wind turbine parts, thus the cost of parts has recently risen above what had been the expected cost. Long-term however, the wind boom is going to drive down the price of wind power due to increased availability and innovation. Wind power requires minimal maintenance. The vast majority of the cost is incurred before and during construction. The operation of a wind farm once constructed is extremely cheap. When the turbines have reached their rates lifespan around 20-30 years, inspections should be undertaken to ascertain the costs and risks of continuing to maintain the wind farm. Wind power burns no fuel. It is a true renewable resource. Human use of the wind for power production cannot use it up. If we deploy this technology well, generations of humans could enjoy the benefits of our investment. Unlike with sources such as coal and nuclear, no substantial cleanup of the power production site is necessary with wind. There are no radioactive wastes such as with nuclear. The chemicals employed to create the turbines, blades and towers do not diffuse into the environment in large quantities like some of the chemicals produced in coal-fired power plants do. Wind power does have a small carbon footprint for several reasons. Firstly during construction and transport there is a lot of carbon-based energy being used. Electricity in most countries carries with it a notable carbon footprint. Transportation systems in the world use a lot of petroleum-based fuels, which directly emit carbon when used. Secondly, concrete is the material generally used for the tower base. Concrete is an energy intensive product where additional CO2 is emitted during the production processes. There does exist C02 sequestering concrete, which can absorb C02 but it has not yet seen widespread adoption4 . Wind power must be spread out over large areas, but the land around the base of the towers can still be used for other purposes, since their physical footprint is minimal. Such purposes are generally ones that do not involve humans being close by for long periods of time, such as farming. There would be some danger inherent in intensive use of space close to wind turbines since up close they can be fairly loud. Additionally, the dangers of a catastrophic failure would then also include possible loss of human lives working nearby. The largest and tallest turbines offer the best cost-per-watt, but a variety of sizes are available. This means that one can buy or build the wind turbine(s) that fit the specific circumstances. Many people have constructed their own working wind turbines. Unlike some other forms of power, the engineering and construction of a basic wind turbine is relatively simple. People can understand it relatively easily. This allows a handy person with skills, money and time to build themselves a working wind turbine. While most power utilities would not allow a homemade turbine to be connected to their grid (without detailed inspection), it would still be useful for off-grid use, perhaps with a set of batteries. This allows intrepid home owners to reduce or eliminate their power bill with their own generation. A downside of wind turbines is that they will create flickering shadows that can be disturbing to people who live nearby. The flickering shadows generally last less than half an hour per day. The effects of this on humans can include distraction, vertigo, headaches, seizures and nausea5 . This is part of the reason why it is the norm to install all large scale wind installations relatively far from heavily inhabited areas. This effect becomes non-existent if the turbines are more than a couple kilometers away. This is because the visual size of the sun becomes much larger than the turbine at these ranges. It has also been noted that wind installations can be a source of annoying noise. People can become stressed due to noise sources near to them. The noise due to wind turbines more than a kilometer away is generally less than automobile traffic, especially in densely populated settings. See our section above on no known health impacts. Home turbines in general are not as efficient as large-scale projects. Large-scale wind generally gets capacity factors around 20-45%, but small scale wind usually gets much lower6 . It is important to note that in the right conditions they can still be excellent investments in windy areas where they are legal. Wind cannot provide consistent baseline power alone in a small geographical region. Wind is not generally steady and constant. Power production would rise and fall depending on the speed of the wind. If a city for instance powered itself entirely with only wind turbines that were built nearby, it would be dependent on the wind speed to remain high enough to power the city. If the wind slowed down too much, the city would not have enough power coming in to meet demand. This drawback of wind can be addressed by using it in combination with dispatchable power sources or by using energy storage. In extremely high-speed winds, most large wind generators must turn off. In Saskatchewan this happens at around 90km/h. This can be regarded as a considerable disadvantage because there is a great amount of energy in the high speed winds that is not being utilized. Also, it means a complete stop to the wind farm’s energy production for the duration of the extremely high wind speeds. SaskPower listed -30ºC as the temperature at which their wind turbines must turn off because of the cold. This is a serious issue in Saskatchewan because the greatest demand for electricity happens during the coldest months of the year. Not all wind turbines share this limit, since there does exist a wind farm on Antarctica7 . Wind turbines have had accidents in the past that caused catastrophic failures. Such a failure can pose a danger to anyone and anything residing nearby. Zoning laws often restrict the construction of urban wind power generation. Sometimes this is not due to the fact that the above issues exist with wind power generation but with the fact that zoning laws are restrictive by nature. Cities may disallow electrical generation equipment in the interest of citizen safety. It seems very feasible to create safe small urban wind turbines, but the laws in many places would need to catch up. Wind turbines have been build on the open ocean. This negates the usage of valuable land, and also negates the problems of urban development. The disadvantage is that they use space on the ocean which has to be near shore. Ocean near shore is usually in high demand. Actual space use is quite minimal, but some groups of people have protested against the construction of offshore wind farms. See “Cape Wind” on wikipedia for an example. At altitudes of about 10km, it is possible to find consistent 160km/h (100mph) winds. Since the wind speed is so much greater, it is advantageous to get as high as possible. Kite or balloon based wind generators can be placed near the jet stream and can in theory produce more than enough power to warrant their complex construction. Research into the possibilities for flying wind turbines continues today. Vertical shaft wind turbines use a spinning shaft that is perpendicular with the ground rather than parallel with it. The vast majority of turbines built in the world so far have been horizontal shaft. Some thought has been given to using buildings to funnel or focus the wind into smaller turbines which could be used in urban settings. Extremely small scale wind power devices have been designed that use the fluttering effect due to the viscosity of air. These devices do not spin, they ‘flutter’. Practical research is still being done into these devices. Saskatchewan has a max production of about 170MW from wind power, due to our three installations in the south west corner of the province. Centennial, Sunbridge, and Cypress. Capacity factors for these installations is above 40%. This is considered extremely high since wind installations around the world rarely see load factors that high. 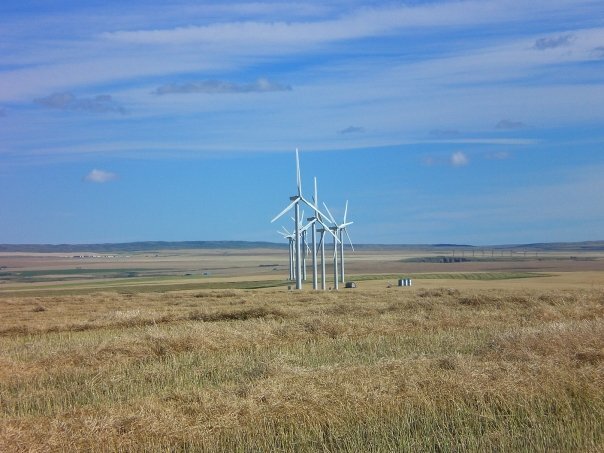 SaskPower currently has about 4% of its power production in the form of wind. There are plans in the works to raise that to 8.5% in the near future. Germany, Spain and France have extensive installations and large-scale investment due primarily to major government support. These countries have stimulated private investment in renewable energy through feed-in tariffs. Denmark has always been one of the world leaders in the area of wind power. They now produce about 20% of their electricity using wind, and they continue to add more every year. This is very impressive considering the small geographic size of Denmark. The intermittent nature of the power is compensated for by generators that can be turned on quickly, both in Denmark and in nearby Germany. Denmark generally exports power when the wind is blowing hard and imports when it is weak. Isn’t the large investment necessary for most large scale power projects? Did I miss something? Does this take transmission costs into account? If one area of the country has a lot of people, but not many turbines, then there is a transmission loss to bring power to that area, isn’t there? Seems to me that transmission issues are what really prevent renewables from taking over globally, at least where technical problems are concerned. Never mind political and economic problems. In general this is regarded as infeasible, and other energy sources are generally used in conjunction with wind power to create a power grid. (See germany’s 1% project, where they power 1% of their country on completely renewable energy). re: Small Scale Implementation (grid) – Maybe there should be a small analysis of the following question: At what distance from a power source do transmission losses make it better for the whole grid for a user to install their own wind turbine? It would be in the best interest of the utility to provide incentives for people at that distance and further to use small-scale renewables like solar and wind. First to address your first question, about the investment for large scale power projects. A wind project requires land rent/taxes and maintenance costs over its lifetime, while the majority of power plants (coal, natural gas, even nuclear) also incur fuel costs over their lifetime. These power plants do not contain all of the fuel that they will burn over their lifetime on site at construction. This substantial cost is the key difference, those power plant types can incur those costs gradually, spreading out the debt load over time. Second question, a more distributed population works best with distributed power. When discussing mega-projects the transmission costs are often included because they are relatively small when compared to the other costs. The distribution pattern would have to be adjusted accordingly with particularly dense areas, and those adjustments would either increase transmission costs or cause intermittency to be more of a problem by increasing the wind farm density near those cities. Regarding non-grid small scale power, I imagine some of those industries are smart enough to do that themselves, without government intervention. After all, if you think it will save you money, why wouldn’t they do it themselves? Your last question, this distance would be highly dependent on the state and other uses for the infrastructure in question. This problem can become very complex very fast as you analyze a line with multiple users at different locations, etc. Also, I wouldn’t consider this a ‘grid’ problem, because if you truely want to remove that power line to save money, the person has to have a substantial enough power system to go completely grid-less. Pingback: Would nuclear be too expensive for Saskatchewan? Pingback: Does nuclear power cost more than other options? Pingback: What does ‘renewable’ mean after all? I have heard that the turbines can be very hard on local populations of bats and some birds. Have you run into much info on that and how it can be mitigated? Also, when I was in Hawaii I got a pretty close look at a pretty impressive wind farm. I was less impressed with the derelict turbines rusting and falling apart right next to the shiny new turbines. Is wind technology moving at a pace where they can no longer salvage parts from/upgrade older turbines? I’m assuming the cost of removing them must be fairly high for a tourist driven place to leave such an eyesore. Jeanette, I have heard numbers regarding birds on the order of one to a few birds per turbine per year, though it varies a lot depending on whether the turbine is placed in a migration pathway. There is a lot of work being done on placing turbines in ways that are known to minimize their effect on migrating or local birds, but without seriously compromising their ability to produce power.